The Mantra on Jolimont Apartments are conveniently located close to some of the Melbourne's major sporting, entertainment and major tourist attractions. This convenient location is what makes it such a popular furnished apartment accommodation destination for business executives, families relocating and holiday makers needing to stay close to the city centre for a short or extended period of time. The Mantra on Jolimont provides a selection of luxury studio, 1 & 2 bedroom self contained serviced apartments situated in leafy East Melbourne opposite iconic Melbourne Cricket Ground (MCG) and walking distance from the Melbourne CBD. The Mantra on Jolimont Melbourne Serviced Apartments are ideal for all sorts of travellers who value convenience and comfort at an affordable price. 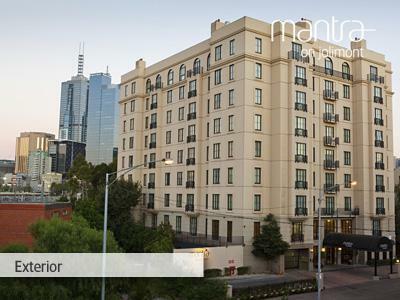 Guests staying at the Mantra on Jolimont will fine excellent public transport options available and that this long term accommodation is close to some of the best shopping in Melbourne. The Mantra on Jolimont is one of Melbourne's largest apartment style hotels, offering fully-furnished apartments that are filled with stylish decor, provide quality service in a great location. The Mantra on Jolimont combines the benefits of hotel services with the freedom and space befitting a private city apartment. All apartments have been designed to maximize comfort and convenience and have recently undergone a full refurbishment. The Mantra on Jolimont is conveniently located close to some of the Melbourne's major sporting, entertainment and tourist attractions including the Melbourne Cricket Ground, Rod Laver Arena, Melbourne Park, Olympic Park Stadium, Royal Botanic Gardens, Victorian Arts Centre and Federation Square. Also the Melbourne CBD is located nearby to this long term apartment accommodation, which is where you will discover premier shopping, world class cuisine and a myriad of opportunities to immerse in Melbourne's famous art and culture. From the Mantra on Jolimont guests are also within easy reach of the Fitzroy Gardens, National Art Gallery, World Trade Centre, Crown Casino, Hisense Arena, Aami Park, Chinatown, Bridge Rd Shopping, Melbourne Central and Melbourne Exhibition Centre.